Square Foot Gardening is a brilliant method that makes the most of your resources. 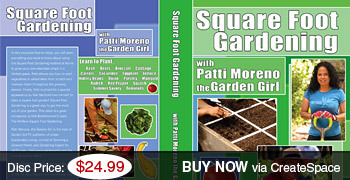 Developed by Mel Bartholomew, who was an engineer, Square Foot Gardening is efficient and effective. The general principle involves spacing your plants in a grid based on the expected size of the grown plant, which allows you to plant only as much as you need, and get the most out of your garden space. Using raised beds of a standard size takes the guesswork out of measuring and spacing your plants, and brings the whole garden easily within reach for planting, maintenance and harvesting. 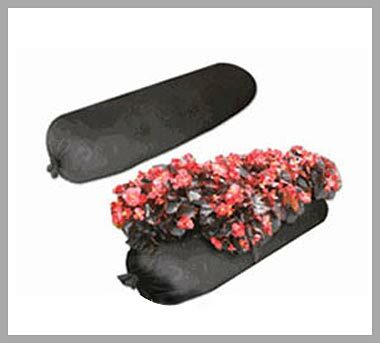 you have complete control over the soil and water conditions, which makes your plants heather, weeding easier, and saves you up to 90% of the water used in traditional row gardening. With so much to gain, why not start a square foot garden of your own? Check out these videos to meet the inventor of Square Foot gardening and author of the best-selling gardening book ever, Mel Bartholomew himself! He's come to Boston to check out my gardens and share his wisdom and advice about growing your own successful garden at home. In this exclusive 60min how-to video, you will learn everything you need to know about using the Square Foot Gardening method at home to grow your own abundant crops in a limited space. 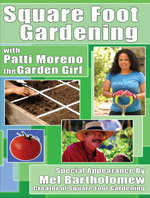 Patti shows you how to start vegetables in raised beds from scratch and maintain them throughout the growing season. 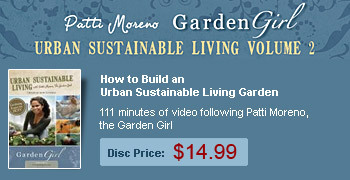 Finally, Patti is joined for a special appearance by Mel Bartholomew himself to plant a square foot garden! Square Foot Gardening is a great way to get the most out of your garden. 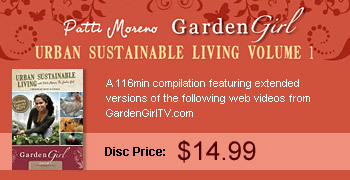 This video is a great companion to Mel Bartholomew's book, The All New Square Foot Gardening. 1) What kind of wood should we use to build a square foot garden? Mel’s answer is simple: FREE. Mel suggests that getting free wood is easier than you think. Just one ride around town, you will most likely see a construction site and where there is a construction site there’s always a dumpster. Most dumpsters hold lots of scrap wood – which is exactly what you need for your square food gardening! 1) Is 6” really deep enough to grow a vegetable garden? The answer is yes! As Mel explains the benefit of 6” instead of 12” is that it is just more efficient all the way around. 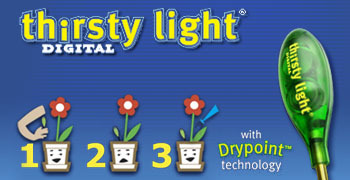 It saves waters, saves seeds and it produces the same quality of vegetables that a more deeply planted garden would. But we understand the question. We have all been taught that for a garden to grow you must dig deep, and till and toil in the garden for hours a day. But Mel learned a most important lesson on a visit to a commercial grain house. He saw a table with 6” boxes on it and healthy plants like peppers, eggplants, tomatoes and beautiful flowers. When he asked how it was possible, they said it’s the “perfect soil,” which got Mel thinking…and the way that Mel’s mix was born. Once again, Mel’s Mix is 1/3 peat moss, 1/3 vermiculite and 1/3 compost. It works! It’s November and Mel Bartholomew has the answers to your monthly raised bed gardening questions. The biggest question based on the weather is simply how does one garden when it’s so cold? Of course, Mel has the answer. 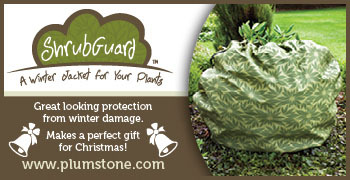 There are some simple ways to protect your plants from the cold. Of course, it always matters where you live and what you have planted, but the elements affect every plant no matter where you live. It’s September, the beginning of the skies turning all sorts of miraculous colors. And as I marvel at the sky and its colors, I look down at my own abundant harvest and wonder what I will do with so much good stuff! Today, Mel and I are going to talk about ways to put it all up. It’s hot! That’s because it’s August, which means only two things to a gardener: it’s harvest time and time to start new vegetables for a fall harvest. The good thing about this time of year is that although it is another planning season, it’s like the planning you do to prepare for spring, but the other way around. Instead of starting your seeds inside and then having to transplant them, you can plant certain seeds outside now and the natural process of the temperature dropping supports the process without your help. In August Mel and I both have abundant harvests of Eggplants, Squash, Herbs and Corn. In our vertical gardens there are pole beans, cucumbers, tomatoes and vertically grown squash. In May we told you about vertical gardening and in June you can already witness it in action right before your very eyes. Tomatoes are the teenagers of the garden and they need guidance. Mel and I suggest that you check on them weekly and sometimes you may have to move them and encourage them to grow up and intertwine them in the vertical support. You may also see your peppers and eggplants, which are already growing to be substantial. You must be mindful of them since when the subtle wind and light rain of June can come and potentially knock the whole bush down. It’s May and the Garden is alive with activity. 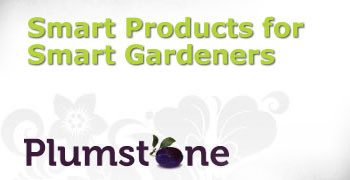 The plants are growing and blossoming and you have already started to harvest and plant some of your summer crops. In one raised bed you may see that you have squares of 16 radishes, squares of 9 beets or squares of 16 carrots and now you can take an empty bed and prepare that for the next set of crops. To do this, Mel suggests that you use a handful of blended compost to prepare and restore the existing soil. It should be compost that includes several diverse elements. Those mixed elements would be from different sources such as a) yard waste like leaves and grass clippings b) barnyard manure (manure of animals that don’t have meat diets) which includes cows, horses, chickens, ducks, etc…and c) elements such as wood chips, bark or sawdust. This blend makes for rich and nutritious compost. April Showers bring May flowers! In this video, Mel and I are going to give you some quick fun hints about what you should be doing in your garden during this exciting time for vegetable gardeners, the beginning of spring. It’s April and so everyone is starting to plant! For those of you who started inside, there is a transition that must take place for your plants or else they will struggle with the suddenness of being moved outside. Although it is April, it’s not necessarily as warm as you think or certainly not warm, consistently. Your seedlings have become accustomed to the very stable environment that you have set up inside. Outside it may be cooler on some days or in the evenings and it may even rain heavily! And there will also be wind that they are not accustomed to. 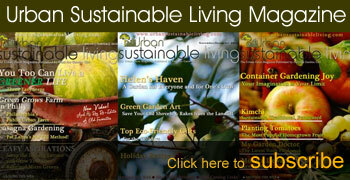 More at our Urban Farm Magazine! 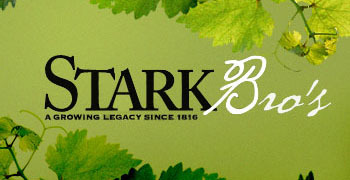 Free Email Subscription to the Magazine! All logos belong to their owners.